Centric Inc. is a proud carrier of Swiss made Wanner grease guns. Wanner grease guns are specifically engineered and manufactured to be utilized in demanding and rough conditions; these guns are tough! There are three types of grease guns common in the woodworking industry. 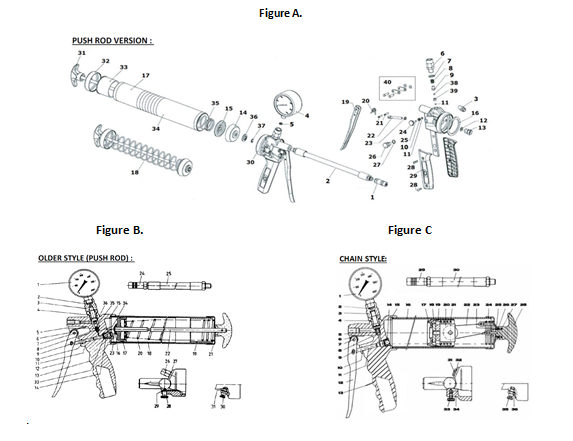 The three main types of grease guns are Figure A. piston type (new), Figure B. piston type (old), and Figure C. chain type. Whatever style grease gun you have Centric Inc.’s knowledgeable staff can service your grease gun back to its original working condition. Wanner grease guns have an economical grip for easy one handed pumping. The head is made from a high quality drop forging aluminum. The cylinder has a rugged design with knurled surface grips for ease of handling. Within the cylinder of the grease gun you will either have a special aluminum piston with cylinder lip seal or a chain style. Chain style grease guns are effective but do have a reputation for grease leaking from the rear of the cylinder and for being messy. Centric Inc. offers a conversion kit to convert your ‘messy’ chain style grease gun into a more efficient piston type grease gun. When using the Wanner grease guns a normal amount of wear and tear will occur. When a grease gun is in need of maintenance the best thing to do is to send your grease gun to Centric Inc. for service. The two most common repairs we service at Centric Inc. are failure to pressurize and failure to maintain pressure. If your grease gun is failing to pressurize there may be a simple fix you can try before sending into Centric Inc. service. Check your grease!! A grease gun failing to pressurize may just be out of grease. If your grease gun is out of grease simply replace your empty grease tube with a full tube of Centric HPG2 extreme pressure lithium grease 2nd grade. Another common issue operators run into is a grease gun failing to maintain pressure. It is recommended that hydro lock tooling be pressurized to 400 bar for safety and production requirements. 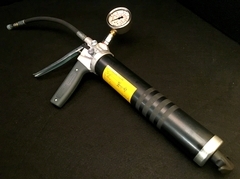 If an operator pumps the grease gun to 400 bar and notice that the gun fails to hold at the desired pressure, then we recommend they send their grease gun into Centric Inc. for diagnostic and service. For more information or to request a quote please contact us at 715-848-4242 or email us at info@centrictool.com. And as always, you can find us on the web at www.centrictool.com.